Color theory states that orange radiates warmth and happiness by combining the energy and stimulation of red with the cheerfulness of yellow. This is a fit description for the harbingers of autumn’s harvest, the seasonally evocative winter squash and pumpkins. 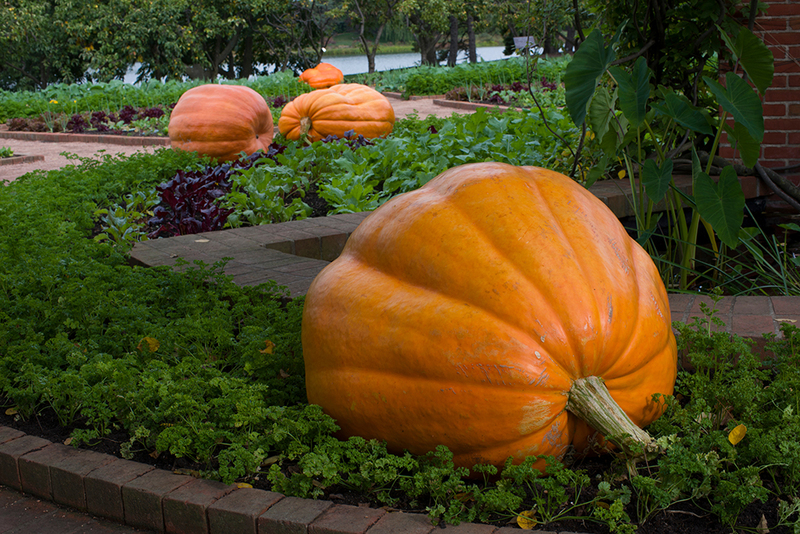 Did I mention that the “Great Pumpkins” have arrived in the Regenstein Fruit & Vegetable Garden? Unbelievable, yet real: Atlantic Giant pumpkins (Cucurbita maxima ‘Atlantic Giant’) adorn beds of parsley, chard, and heirloom root vegetables. So visually compelling is the color-saturated rind of the world’s largest fruit, and so heavy. All of this certainly explains what your fruit and vegetable team has witnessed in the Garden. There is pure joy as our visitors first glimpse the great pumpkins—ooohs and ahhhhs and squeals of delight, as folks of all ages decide how best to connect with the fruit: Is it real? Should I touch it? Should I sit on it? Hug it? Photograph it? People even talk to our anthropomorphic fruit. But the giant pumpkins are just one part of the diverse Cucurbita garden art growing in the Fruit & Vegetable Garden this season. While they seem to be called “squash,” “pumpkin,” and “gourd” interchangeably, there is actually a science to identifying these cultivars, and pretty much everything called “pumpkin” is really a squash—although “pumpkin” is most commonly used to describe those distinctive orange orbs. Cucurbita maxima are squash with softer rinds and flesh, growing on long vines with large, hairy leaves. Harder-skinned “winter squash” are typically Cucurbita moschata, including butternuts and acorn squash. They also have trailing vines and hairy leaves, but tougher flesh and rinds, and a ridged but still soft stem. Only Cucurbita pepo are considered true pumpkins, with tougher flesh and rinds, leaves that are downright prickly (not just hairy), and a woody five-sided stem. Warted hubbard squash (Cucurbita maxima ‘Chicago’s Warted’) is delicious now, and delicious later. Cucurbita maxima ‘Chicago’s Warted’ is an heirloom developed by Budlong Gardens of Chicago. It was introduced by Vaughan’s Seed Store of Chicago in 1894. The 13-pound fruit are dusky olive green, and deeply wrinkled and warted with a classic hubbard squash teardrop shape. These gems have a fine-grained, sweet orange flesh. We planted ours way back at the end of May—perfect timing for this 110-day crop. The hubbards are versatile winter squash that can be eaten right after harvest, or stored until the flesh sweetens around the new year. Australian blue squash (Cucurbita maxima ‘Queensland Blue’ ) can be stored for an incredibly long time. 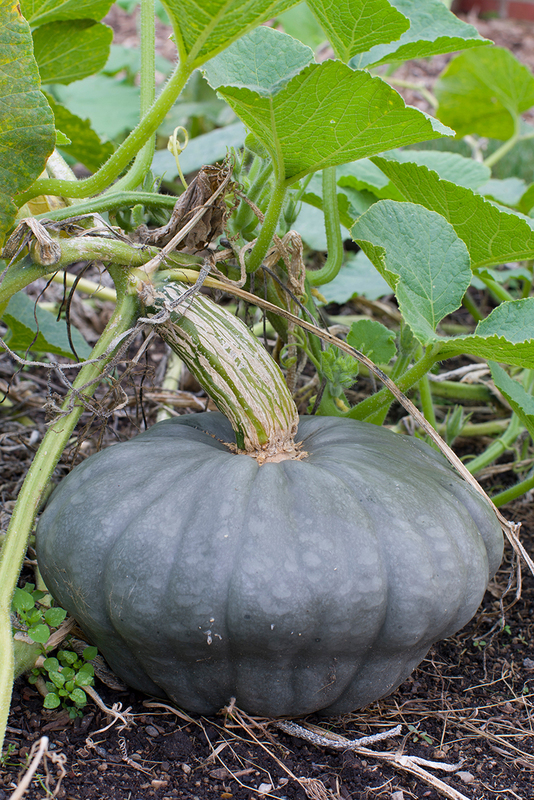 A member of the avant-garde Australian blue group of squash, Cucurbita maxima ‘Queensland Blue’ is not often seen growing in the field. 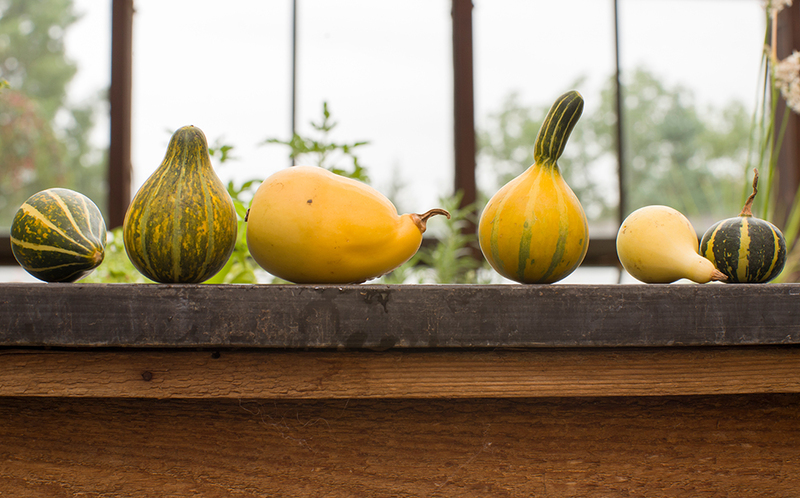 While they hail from South America, the blue squash varietals grow equally as well in Australia (for which they are named) because of similar temperatures and length of growing season. We found the seed at Seed Saver’s Exchange in Iowa. This is a bottle-green keeper that, if properly harvested and well-cured with a 4-inch “handle,” will store for more than a year—maybe two. It is a fantastic eating-quality squash with smooth, rich, brilliant orange flesh. Waltham butternut squash (Cucurbita moschata ‘Waltham’) looks like a buff-colored peanut. 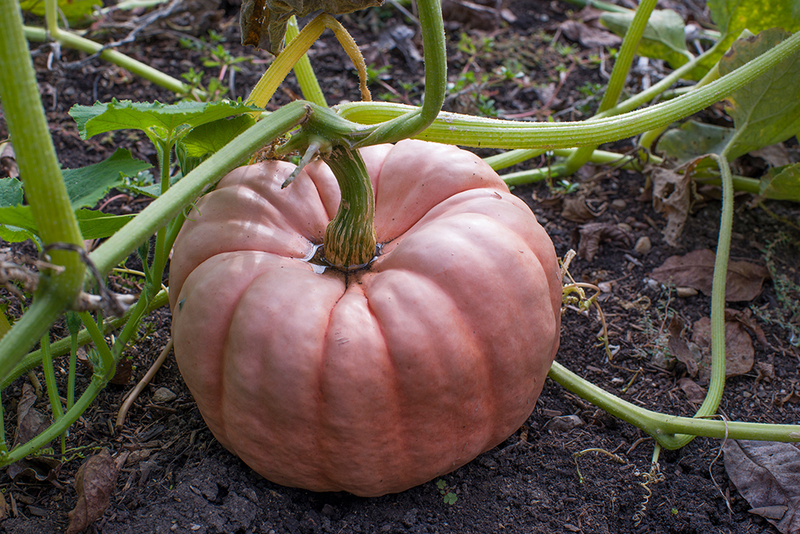 Cucurbita moschata ‘Waltham’ looks like a blocky, buff-colored peanut. We planted it in the warm soil of mid-June, which squash of this species prefer. Waltham butternut is a uniform producer that must be harvested before the slightest touch of frost. Moving this Atlantic Giant to its current location took a full day of careful handling…and more than one forklift. 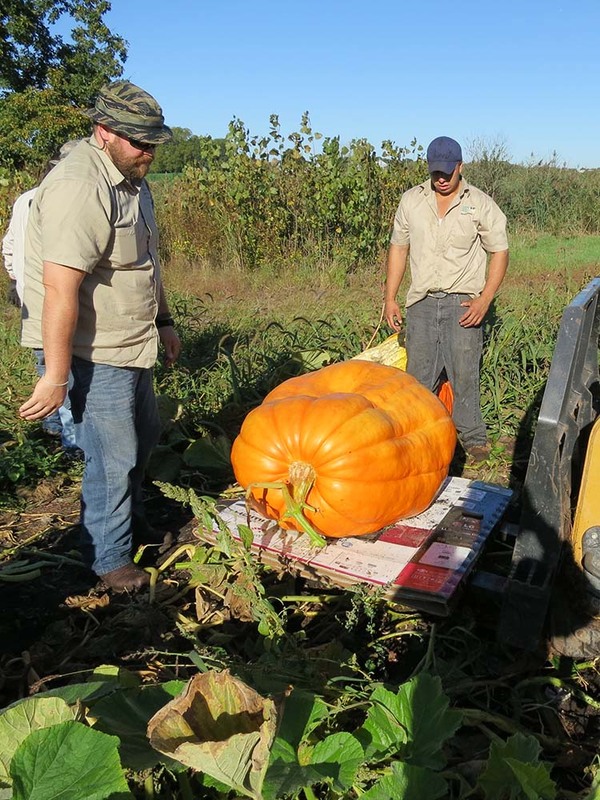 Make sure you have a forklift available before you think of growing Cucurbita maxima ‘Atlantic Giant’, which can easily grow in excess of 1,000 pounds. 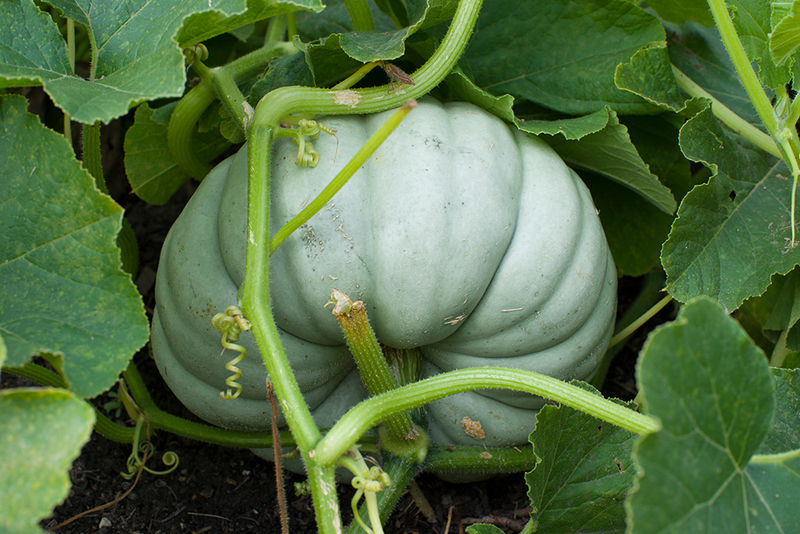 This squash that looks like a pumpkin surprisingly does not need much more room than the average pumpkin patch to grow, but organic compost can help boost its final size. Cucurbita pepo ‘Winter Luxury’ is diminutive in stature but mighty in taste. The fine, rough netting around the shell is a distinguishing feature of this 1896 heirloom. This is the gold-standard pie pumpkin that can be eaten right out of the garden. It won’t store as long as the other species. 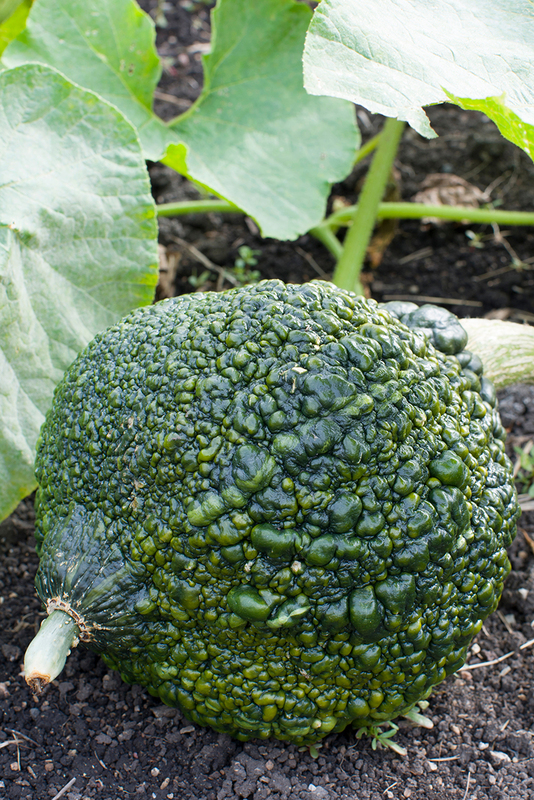 Cucurbita maxima ‘Jarrahdale’—our second unusual Australian blue—is a deeply-grooved, slate-gray squash with dense, sweet, deep orange flesh and a thin skin. Purchase Porcelain Doll (Cucurbita moschata ‘Porcelain Doll’) seed from Pink Pumpkin Patch Foundation. Cucurbita moschata ‘Porcelain Doll’ is a pink cheese pumpkin that has become the symbol of breast cancer awareness among pumpkin growers across America. Growing this decorative hybrid will ensure a donation to research is made. 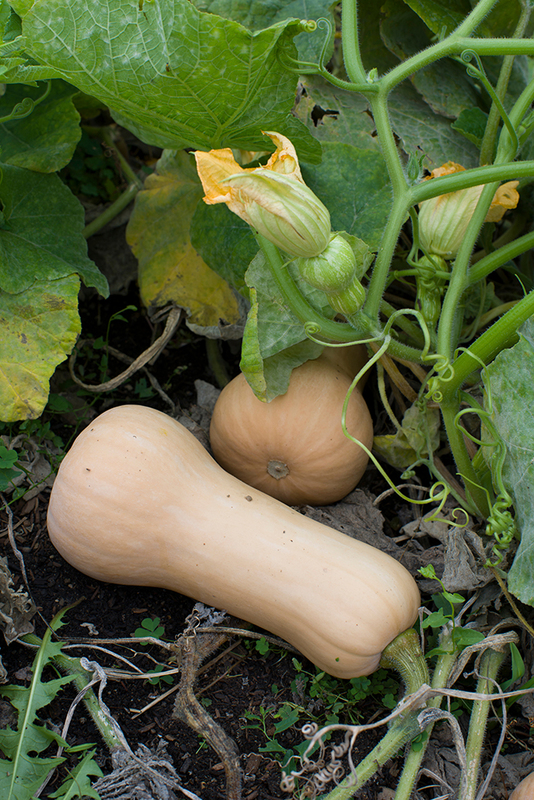 Grown for display, these Cucurbita pepo ‘Small Mixed’ gourds are generally better food for squirrels and raccoons. There are three basic types of gourds in the Cucurbitaceae, or squash family: Cucurbita (ornamental squash), Lagenaria (utilitarian gourds used for things like containers or birdhouses) and Luffa (vegetable sponge). These Cucurbita pepo ‘Small Mixed’ ornamental gourds are just pumpkin varieties with poor flesh quality—either too fibrous or too watery for eating—but with beautiful color and texture for use in fall arrangements. We grew these up on a trellis. They store better in a cool environment but can easily last indoors for seasonal holiday decorating. Choosing a pumpkin this weekend? Handle pumpkins carefully, by using two hands to lift them. Although it is tempting to pick pumpkins up by the “handle,” a pumpkin’s decomposition accelerates once the stem has broken off. Well-grown pumpkins should be heavy for their size, with telltale ripeness indicators like deep, saturated color, and brown stems. The rind should be hard—impenetrable when lightly pressed by a fingernail—and have a glaucous, dull sheen. Once you get your pumpkin home, wash the rind with a mild bleach solution to remove bacteria and extend the life of the pumpkin. I just cannot resist asking: Orange you glad you visited the Regenstein Fruit & Vegetable Garden? 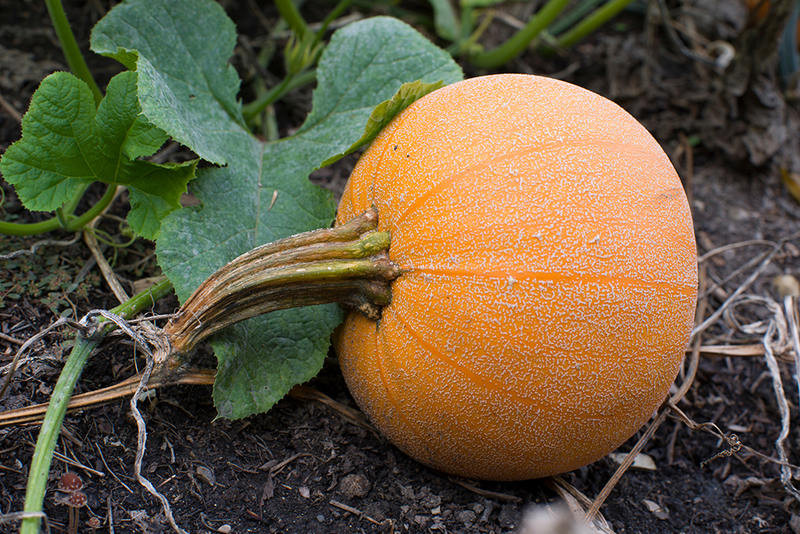 Learn more about pumpkins in Plant Information and The Smart Gardener. There are three sister spirits who dwell among the fields and protect the crops. Sister Corn, with hair of gold, stands tall as the guardian of the crop. Sister Bean feeds the shallow roots of Sister Corn (beans draw nitrogen from the air into the soil), then reaches for the sun as she twines in a spiral up her sister’s sturdy stalk. Sister Squash, the eldest of the three, stays close to the Earth, encircling her sisters protectively with her large, prickly leaves that shade the soil and hold in moisture. Planted together on a mound of Mother Earth’s nurturing soil, the sisters receive water from Father Sky, who arches above them. The Iroquois called the Sisters “De-o-ha-ko,” which translates to “life support,” not only because the plants rely on each other as they grow, but also because, eaten together, they provide a healthy, life-sustaining diet for humans. Corn is rich in carbohydrates and amino acids, beans are rich in lysine (an amino acid that corn doesn’t supply), and squash seeds provide protein and vitamins essential for growth and development. “De-o-ha-ko” recognizes that humans are one and the same with the plants they eat. Resolve to plant the Three Sisters in your vegetable garden in 2013…and Happy Thanksgiving!